Soon enough the weather will be warmer and/or muddy because of the season change. I can’t wait and so is my 4 years old son who gets really bored now because of a long wait for winter to be finally over. Though we still have below 20F temperature outside at least the sun looks deceiving and sunny, meaning it is giving us hope those warmer days is coming. Soft Star gave me the opportunity to receive a pair of their handmade products for my little one. I want something cool and lightweight for my boy and I’ve picked Child Sandal with Elastic - Black / Shiny Pewter, retail value $46.00, size 8. Kids’ feet grow faster, that’s why I prefer to get a bigger size for him. Just to let you know, that you can also design your own shoes for your kids in case you want to create your own. Allows natural foot movement and development. Natural leather is formaldehyde-free and colored with non-toxic dye. Rubber sole is thin, flexible and durable. ***Soft Star Shoes are Handcrafted for Healthy, Happy Feet! We are passionate about minimal footwear for healthy development of bones, muscles and balance. Everything we do, from design to customer service, provides our customers with high quality, functional and fun shoes. Our workshop is located in a loft alongside the Willamette River in Corvallis, Oregon. All of our products are handcrafted to order. We sell our shoes exclusively via the Internet, our workshop showroom and word of mouth. We value our work, we give back to our community and try our best to be good citizens of the Earth. We welcome you to give us a call with questions or suggestions. When it came in the mail, I like how secure the product in the package, I love how the packaging as well as those little notes that come with it. Honestly, my son wasn’t too excited with his new pair the first thing he saw it. I believe that’s what the normal reactions they always have because it isn’t junk foods, nor toys. Apparels are kids less interest and we mothers all know that. It didn’t take an hour after he determines that he likes his new sandal. He even got his own name for it, and he calls it the Star Shoe. 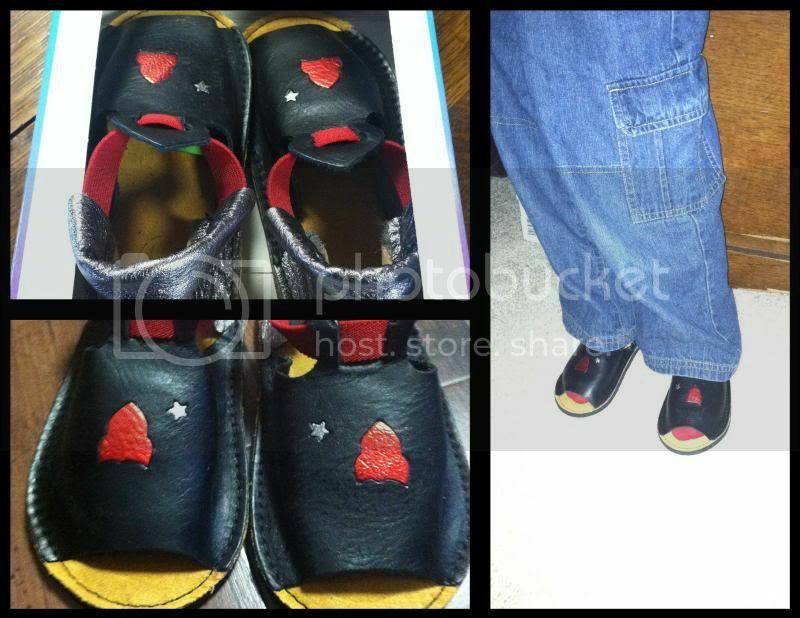 I like how fine the quality of the product, it also has a nice elastic to help hold the sandal on my son’s feet. Definitely great for indoor and outdoor activity, as for now my son wears it as his inside shoe. Very lightweight, thin, looks durable and flexible as well, I would say worth the money to pay for. Overall, my familiarity with Soft Star Child Star Sandal is great. I can see the purpose and how sturdy for my rambunctious son. In addition, I can see that my child enjoys the sandal as he wears it often now, meaning something he would keep as he is comfortable with the shoe. If you would like to purchase or browse the website, please visit them at http://www.softstarshoes.com/. You may also connect with them on Facebook and Twitter to learn more about what’s new. A disclaimer: This is NOT a sponsored post. I received the Soft Star product for free in exchange of my honesty review. The outlook I expressed is 100% exclusively mine. Your own design on your kids feet sounds enticing. I'm sure Mommy's would go for it just so their kids can wear a one of a kind pair. one happy feet indeed. it look soft which is good for babies..would try to visit the site and loo for girly shoes for my daughter. That's so cool that they would even allow you to design your own child's pair of shoes. The material looks so soft and comfy. Do they have them in adult sizes too? Looks like a made with high quality material too.